Commercial Grade Fixtures. Maximum layout flexibility. 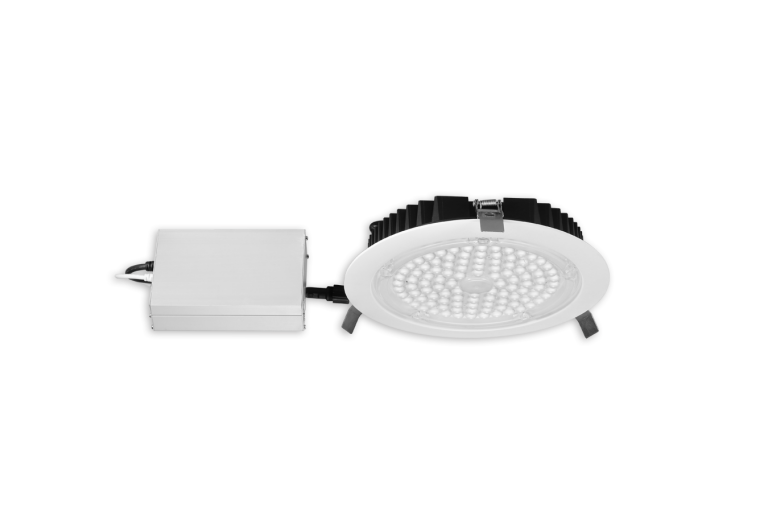 Round 8″ fixtures with integral LEDs. Isolated external driver factory installed inside connection box. One driver for every fixture required. Space in ceiling needed – 2 1/4″. 1. Locate next to the fixture – run line voltage wiring to first junction box and “daisy chain” to the junction boxes of the other fixtures. 2. Or install all drivers at one location and use low voltage extension cables to the fixtures. Use only extensions provided by the manufacturer. Available jumper cables are 6 feet (1.8m) and 20 feet (6m). Cables are linkable. Maximum run should not exceed 40 feet (12m). Soft White 3000K is yellowish, similar to halogen and incandescent light. Neutral White 4000K is whiter, colder and more energizing light.